Teyla Emmagan is among those fleeing the eminent explosion of the Stargate in Atlantis. Rocked by the blast, she radios John Sheppard who remained in the control room with Dr. Radek Zelenka. The Stargate has vaporized and the wall behind it shattered. Teyla finds Sheppard protecting Zelenka. While Marie, the head nurse, removes glass fragments from Sheppard’s back, technician Amelia Banks establishes a new control room. On the Daedalus bridge, the Wraith Todd believes that his human allies have betrayed him by activating the Attero device — which causes any Wraith ship entering hyperspace to explode. He orders the unconscious human crew taken to a hanger bay. After reinforcing the edict against using the hyperdrive, he leaves his own hive ship behind and sets the Daedalus on course for Atlantis. Captive on the ice planet M6H-987, Rodney McKay explains to Daniel Jackson how Janus’s device creates sub-space turbulence which affects Wraith hyperdrives (“First Contact”). In so doing, it generates radiation that affects the basic operation of Stargates. When any gate in the Pegasus Galaxy is dialed, power builds up within it and causes the gate to explode. The Daedalus drops out of hyperspace far enough away to avoid attack by drones, but within communications range of Atlantis. On board the ship, Richard Woolsey regains consciousness. His arm draped teasingly around Woolsey’s shoulder, Todd explains that he was alive 10,000 years ago when the Attero device was first used against Wraith. It was shut down because the Ancients realized exploding Stargates would kill millions of humans. Todd tells Sheppard that he wants the location of the device, or he will kill the Daedalus crew — beginning with Mr. Woolsey. Surmising that McKay, Jackson and the device are all on M6H-987, Sheppard gives Todd the planet’s coordinates in exchange for Woolsey’s life. The Daedalus heads back into hyperspace. Almost immediately, Atlantis is hailed by Katana Labrea, one of the space-faring Travelers (“Travelers”). She tells John that, for the first time in 100 generations, the nomadic race has built a planet-bound colony — only to lose 3,000 people and two ships (one of them their Ancient vessel), when their Stargate exploded. Sheppard shares what he knows and asks for help. He and Zelenka are soon aboard Katana’s ship, hoping to beat Daedalus to M6H-987. Aboard the Daedalus, Ronon Dex pries open a bulkhead door, allowing him and Jennifer Keller to make their way to the engineering section. Opening the control consoles and shooting out crystals, Ronon forces the ship to drop out of hyperspace. On the ice planet, the powerful alien warriors — still shrouded in their advanced armour — come for Jackson. The leader is adamant that the Wraith must be destroyed. As they do not use Stargates, he is indifferent to the deaths of the millions of humans who depend upon the Stargates. But Jackson wonders why they are still in their combat suits, and goads the alien into revealing himself. He emerges from the suit, revealing that he is Asgard. 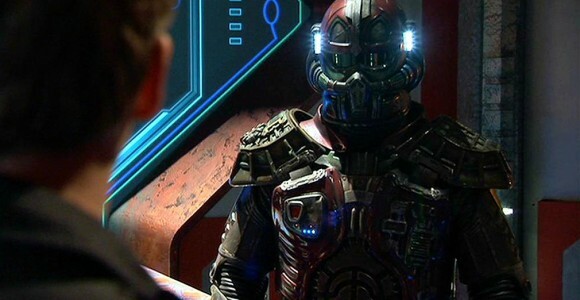 A group of Asgard, he tells Daniel, came to the Pegasus Galaxy many thousands of years ago to pursue unethical research on humans in order to forestall their own genetic degradation (SG-1: “Revelations”). And they made substantial progress. But the Ancients and Wraith were at war. As the Wraith tolerate no other technologically advanced society, they attacked the Asgard after defeating the Ancients. The Asgard lost their intergalactic ships. Unable to return to their home galaxy, they retreated to the planet — where the atmosphere became more and more hostile, forcing them to build the exoskeleton suits they now wear. Now, however, even the suits are not enough. Forced to find a new homeworld and refusing to allow their civilization to be obliterated, they will do anything to defeat the Wraith. By the time Jackson is reunited with McKay, McKay has figured out how to escape the room where they are being held. Jackson shares what he has learned as they head to the room where the Attero Device is located. Along the way, they find two empty suits. Disguised within, they enter the control room and disable the guards. When Todd’s soldiers reach Engineering, Keller turns herself in as the saboteur, allowing Ronon to secretly remain free. When they reach the bridge, Keller learns that Ronon’s efforts have irreparably damaged the weapons systems — although the hyperdrive is quickly restored. As she is taken to lock-up, Ronon rescues her. Together, they free the rest of the crew. The crew arm themselves to retake the ship — but when they reach the bridge, it is empty. All of the Wraith are in the F-302 bay. Ronon goes to investigate. Major Marks attempts to drop Daedalus out of hyperspace, but he has been locked out of the system. The Traveler ship drops out of hyperspace near the ice planet. They have arrived before the Daedalus, and are swiftly attacked by two Asgard vessels. As Sheppard, manning the weapons, takes out one, a third ship escapes into hyperspace. They are battling the remaining vessel when the Daedalus arrives. This triggers a Wraith program … which sets the Earth ship on a collision course with the facility housing the Attero Device on the planet’s surface. With the Daedalus racing toward the planet, the Dart departs. With no way to regain control of the ship and save the crew, Sheppard uses the Traveler ship to briefly open a hyperspace window just ahead of the Daedalus, allowing both vessels to pass through the planet unharmed. By the time they emerge, Marks has regained control. The remaining Asgard ship attacks, but is destroyed. Down on the planet, McKay and Jackson enter the room with the antenna array — the heart of the Attero technology. Electrical energy flashes through the room as he tries to locate the control crystal. Several bolts hit Jackson, helping McKay isolate the necessary crystal. He successfully deactivates the Attero Device. The Daedalus beams the two aboard, and Woolsey orders the entire facility destroyed. Back home in Atlantis again, Keller tells Ronon that she is not romantically interested in him. Zelenka repairs the damage to the Traveler ship. Jackson, in the Infirmary, will be recuperating on Earth as soon as the new Stargate is installed. And Todd and the surviving Asgard remain at large to threaten Atlantis again. VOTE! 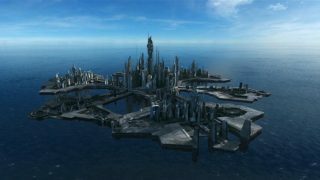 How would you rate Atlantis's "The Lost Tribe?"